VISTA, CA (October 1, 2018) – Effective immediately, Delicious Tuning has converted all EcuTeK programming packages to ECU Connect Bluetooth Programming Kits. Previously, we offered EcuTeK programming cables. This means that not only can you program your ECU, many additional features and options have been added at about the same price as before. ECU Connect supports almost all OBD-II compliant vehicles as far back at 1996, so no need to borrow a code scanner, pull out a laptop or head to a local automotive facility to see what is going on with the vehicle. With the BlueTooth ECU Connect, you can connect to your vehicle's ECU through your iPhone or Android device by way of the free downloadable app. The app allows for RaceROM customization (by your tuner) through the app, with such things as louder/quieter pops/bangs, more/less aggressive traction control, boost control slider, switchable maps, etc... Because the ECU Connect also has the ability to work on nearly all OBD-II compliant vehicle the app can review check engine lights, clear stored codes, store datalogs from your vehicle and send those logs directly to your tuner or repair facility for review. 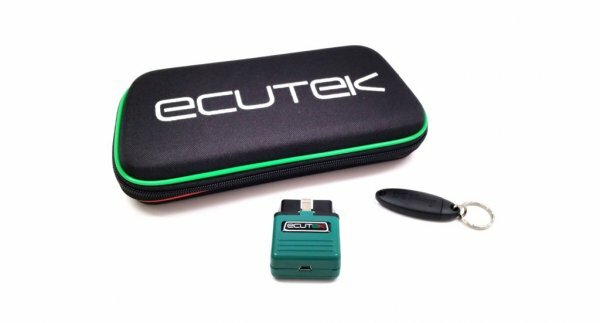 For those of you that autocross or track their vehicles, this is a great way to log your vehicle with EcuTeK ECU Connect and a compatible phone. It is small, out of the way and allows for full data logging of your vehicle, for your tuner to review.